To unlock and purchase these packs, simply add any available hockey trading card product on e-Pack to your cart. 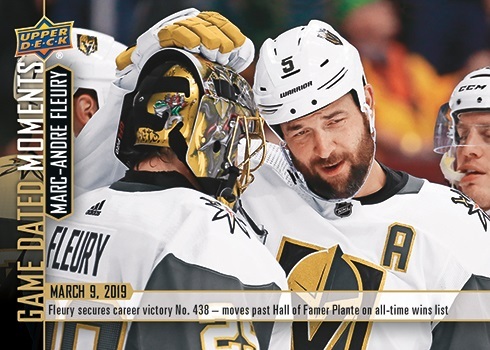 * This week’s pack of 2018-19 Game Dated Moments cards will be available for purchase in the Upper Deck e-Pack® Store until 3/22/2019 at 8:59 am (PST). 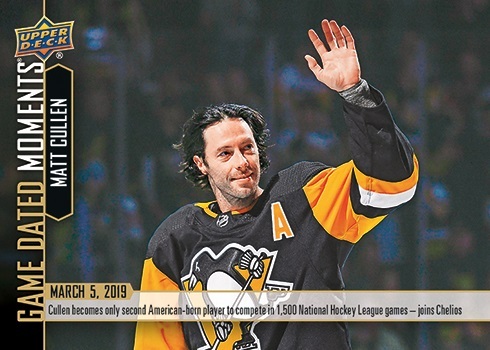 Matt Cullen laces up for his 1,500th career game following an impressive opening ceremony celebrating the veteran player’s accomplishment, as he follows in legend Chris Chelios’s footsteps as the only other American born player to reach the milestone during their career. Pittsburgh’s Captain continues to add to his legacy joining “Jumbo Joe” as the only active players to reach the 1,200-point milestone, as he goes on to add 2 more points and an assist on teammate Jake Guentzel’s OT winning goal in an exciting and historic night for the Penguins. **Not all images are shown. Please head to the Trading Marketplace to see all card images. Marc-Andre Fleury joins the group of goalies who have been wreaking havoc on the all-time goalie leaderboards this season as he passes up Hall of Famer, Jacques Plante, for sole possession of the 8th spot on the all-time wins list after securing his fifth consecutive win in a 6-2 victory over the Canucks to put the Vegas goalie within seven wins of tying Sawchuk for the lucky number seven spot on the all-time list. Stay up to date by following the Upper Deck e-Pack® NEWS page for future announcements regarding Game Dated Moments! Head to the STORE to get your cards now! 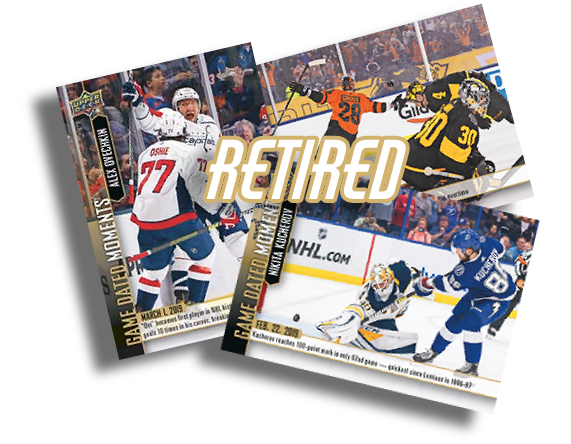 ***To purchase Game Dated Moments packs in the e-Pack store, you must purchase at least one other (non-Game Dated Moments) Hockey trading card product in the same transaction on e-Pack. Adding a hockey trading card product to your cart will unlock the Game Dated Moments product and allow you to add up to 99 of every available unique Game Dated Moments packs to your cart. There is no limit on the number of Game Dated Moments packs you can purchase, but only 99 of each pack may be purchased in a single transaction. Game Dated Moments cards may be shipped or transferred to a linked COMC account. However, this option will not be enabled until 3-4 weeks after the corresponding packs are expired from the e-Pack store. If you have a Game Dated Moments card in your collection on e-Pack when the option to be shipped has been enabled, you will receive an e-mail from e-Pack alerting you.